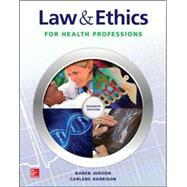 Law and Ethics for Health Professions explains how to navigate the numerous legal and ethical issues that health care professionals face every day. Topics are based upon real-world scenarios and dilemmas from a variety of health care practitioners. Through the presentation of Learning Outcomes, Key Terms, From the Perspective of, Ethics Issues, Chapter Reviews, Case Studies, Internet Activities, Court Cases, and Video Vignettes, students learn about legal and ethical problems and situations that health care professions currently face. In the seventh edition, chapters 3 and 8 have been substantially revised to reflect changes in today’s health care world. Students also use critical thinking skills to learn how to resolve real-life situations and theoretical scenarios and to decide how legal and ethical issues are relevant to the health care profession in which they will practice. Law & Ethics is available with McGraw-Hill Education’s revolutionary adaptive learning technology, LearnSmart and SmartBook! You can study smarter, spending your valuable time on topics you don’t know and less time on the topics you have already mastered. Join the learning revolution and achieve the success you deserve today!